Most of you probably have questions when it comes to resume writing. If you are not comfortable writing them consider hiring a resume writer. But if you like to write your own consider the latest trends you should be following. Don't list every school you attended. Resumes are removing all unnecessary information and in 2017 are even more summarized. List only schools that are most relevant to your application or those with the highest credentials. Hiring a professional resume writer. New resume writing companies are popping up every day, because people are too busy to keep track of the latest trends. 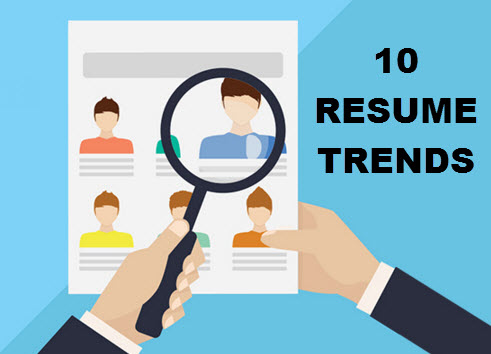 These companies stay current with trends, including the latest resume format. The market for professional resume writers will continue to grow in 2017. Prove experience & accomplishments. You won’t get away with lying on a resume today. Employers now want evidence of the experiences and skills that you list. List Your LinkedIn Profile URL. LinkedIn has really grown in recent years, and 2017 is no different. Your LinkedIn profile could become your online resume. Many employers are head hunting good candidates here. It’s conceivable to think that we won’t even apply for jobs in the future. Instead, employers will probably call you before you even know about the job. Get on Twitter Employers are going to look at your online presence, so be sure to have a professional twitter account. Sharing your knowledge with your followers and being consistent could be viewed as leadership skills. Avoid using ALL CAPS. Using all caps has been unacceptable for quite a while. You don’t want to appear to be screaming throughout your entire resume. Stick to one page.You need to be able to summarize your knowledge and abilities very well, because managers and employers don’t have time to waste. You should be able to sum everything up thoroughly in this limited space. This is a skill you’ll need to master to keep your resume current. Follow Instructions.Many details are sent online nowadays. Many companies now provide a document for the applicant to complete and send as a resume. Instead of sending your own resume, you are simply capturing your data on their system. Applicant tracking systems are everywhere.You’ll need the ability to write a resume with specific keywords which will be picked up by the company’s ATS. Bullet points are great. Say goodbye to paragraph style resumes. A resume today is almost impossible to write without the use of bullets and numbers. Look for employers to begin insisting on this for an easy point read. Watch out for colors. Forget about trying to be super creative with your resume. Employers do not want to read a light yellow font, and this is unacceptable nowadays. To prevent eye strain and having it read incorrectly, a professional document is always written in black.